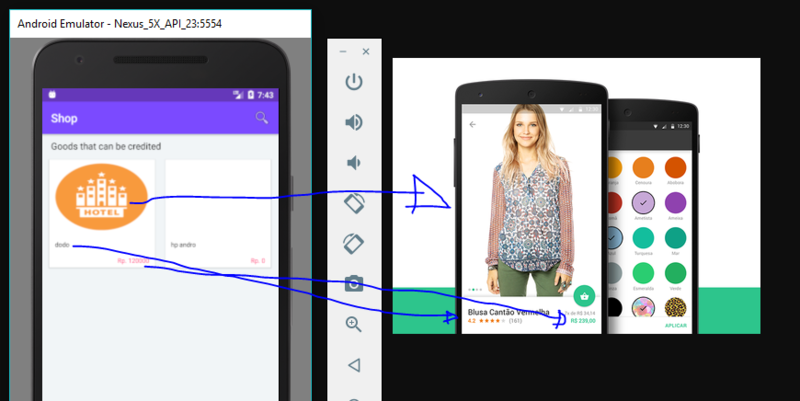 Android Bottom Navigation stays at the bottom of the screen providing navigation between top-level views in the app. This is introduced in design support library with backward compatibility. Bottom Navigation should be used when the app has three to five top-level navigations. This article explains the basics of Bottom Navigation, combining it with Fragments. We also going to learn how to load the first fragment with grid data (using RecyclerView) by fetching JSON through HTTP call. The Bottom Navigation can be easily added using BottomNavigationView component. You have to use gravitation or relative attributes to make it appear at the bottom of the screen. Here few important attributes have to noted down. app:menu — The menu resource file to display the navigation items along with icon and text. app:itemBackground — Applies background color to bottom navigation. app:itemTextColor — The text color of bottom navigation item. app:itemIconTint — The icon color of bottom navigation item. When to use Bottom Navigation? As per the design specs, the below navigations should be used depending on the criteria. > Navigation Drawer – Use when top-level navigation has more than six destinations. > Tabs – Use when there are two navigational destinations. > Bottom Navigation – Use when there are three to five top-level destinations. Before going further, have a quick look at the design specifications of Bottom Navigation. Now let’s try it by creating a new project in Android Studio. 2. Download this res folder and add the drawables to your project’s res. This folder contains necessary drawables required for bottom navigation items. 3. Make sure you have design support library in your build.gradle. 4. Add below color, string values to your colors.xml and strings.xml. 5. As the Bottom Navigation items rendered using a menu file, create a new xml named navigation.xml under res ⇒ menu folder. 6. Open the layout file of main activity i.e activity_main.xml and add BottomNavigationView widget. Here we are also adding a FrameLayout to load the Fragments when the navigation item is selected. 7. Now open MainActivity.java and modify it as below. > Here, OnNavigationItemSelectedListener will be called when the bottom navigation item is selected. For now we are just changing the toolbar title upon selecting the navigation item. If you run the app, you can see the bottom navigation displayed as shown below. As we have the Bottom Navigation ready, let’s see how to switch views when the navigation menu item is selected. This can be done easily by using the Fragments. I am creating four fragments named StoreFragment, GiftsFragment, CartFragment and ProfileFragment. 8. Create new Fragment by going to File ⇒ New ⇒ Fragment ⇒ Fragment (Blank) and name it as StoreFragment.java. Likewise create other three fragments too. 9. Open MainActivity.java and modify bottom navigation listener as below to load the fragments in FrameLayout. > loadFragment() – loads the Fragment into FrameLayout. The same method is called in OnNavigationItemSelectedListener callback by passing appropriate fragment instance. > The logic needed for specific module goes into appropriate Fragment keeping the MainActivity clean. Now if you run the project you can see the fragments loaded when navigation is selected. Now we’ll see how to implement the first fragment i.e ShopFragment which displays the shop items in a Grid fashion. 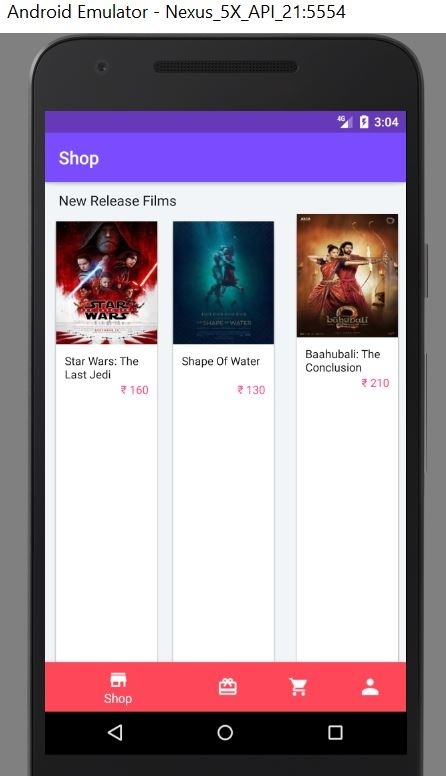 For demonstration, I have created a sample json which contains few movies for sale. To implement this, all we have to do is, fetch json and display the data in RecyclerView in a grid format. To make the task simpler, follow my other article which explains the same. 10. Open build.gradle and add RecyclerView, CardView, Volley and Glide dependencies. 11. Create a class named MyApplication.java implement the class from Application. This is a singleton class in which volley library will be initiated. 12. Open AndroidManifest.xml and add MyApplication to <application> tag. We also need INTERNET permission as we gonna make http calls. 13. Open the layout file of StoreFragment i.e fragment_store.xml and add below layout code. Here we are adding the RecyclerView component. 14. Create an xml layout named store_item_row.xml under res ⇒ layout. 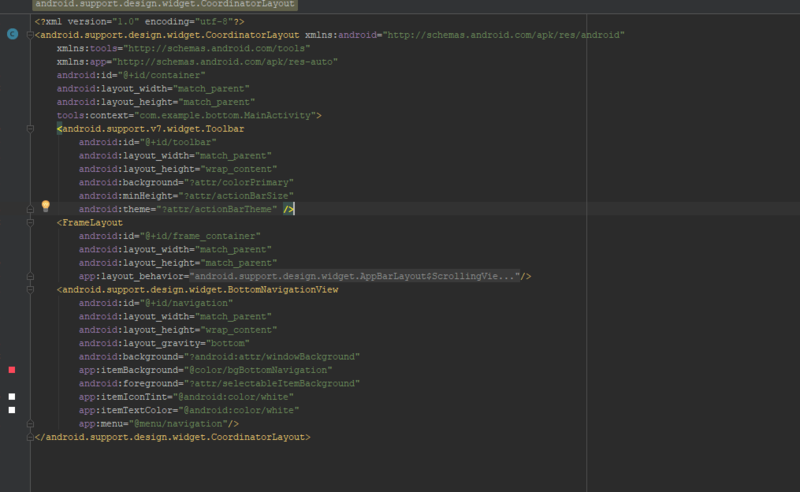 This layout file will be used in RecyclerView adapter class to render single item. 15. Create a class named Movie.java. This POJO class will be useful while parsing the json. 16. Now open StoreFragment.java and add below code. For simplicity the RecyclerView adapter class StoreAdapter included in the same fragment. > fetchStoreItems() Method fetches the movies json using Volley and serializes it using Gson. > StoreAdapter class renders the movies in RecyclerView. 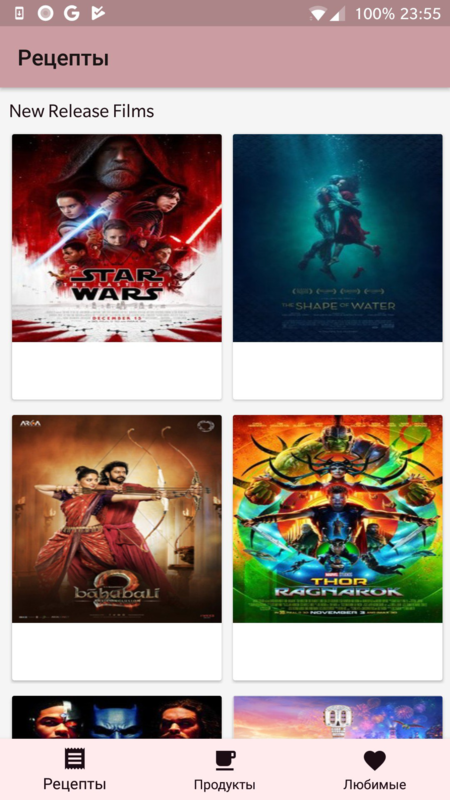 Now if you run the app, you can see the ShopFragment displaying the movies in grid manner. Likewise you can implement other fragments too. As per design specs, the Bottom Navigation has to be hidden when the content is scrolled giving more room to content on the screen. To achieve this, we need to attach the BottomNavigationBehavior to Bottom Navigation. 17. 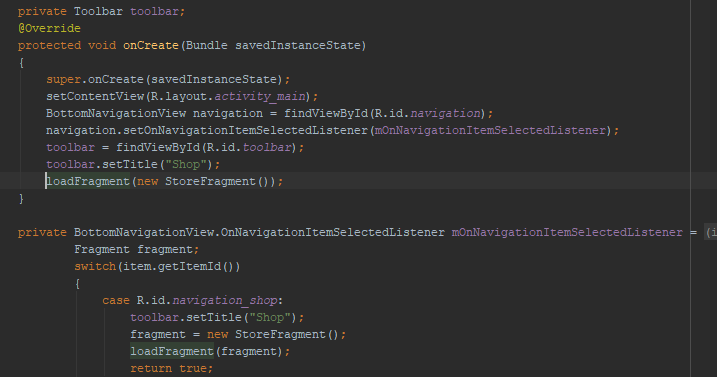 Create a class named BottomNavigationBehavior.java with the below code. 18. Add the BottomNavigationBehavior using setBehavior() in MainActivity.java as shown below. Now if you test the app, you can see the Bottom Navigation sliding down when the app content is scrolled. Thank you Ravi! Marry Christmas! Can you double check the direct link for .APK file of this project, please? Thank you once again! Happy Christmas you too 🙂 I just tried the apk, it’s working fine for me. Thanks for the reply. Everything works fine now. Maybe mobile Chrome had an issue. Marry Christmas! I have to prepare one. Meanwhile you can check sync adapters from android docs. This class is not created during the tutorial. Yes, I forgot few steps. Updated the article (added 11th and 12th steps), please check once. Thank you Ravi, you are doing a good job by educating beginners like me with your knowledge. I have some challenges here. I am building a video player using recycler view to list all video files on my device and i am stuck. i want each row to include the title of the video, the size, date added and duration. could you help me out with a template code that i can study and improve on to achieve what i want. Thank you. Merry Xmas. Thanks Ravi but there is a problem with bottom nav bar behaviour when we display snack bar it will hide below navigation bar if we use that behaviour. Screenshot wont help because snackbar not showing just because for adding behaviour. not only me many people faced this see this is my answer on stackoverflow https://stackoverflow.com/a/44778453/7130121 people facing snackar issue thats why i came here to see implementation but your implementation is silimar. Do u have any idea what to do? No Abhishek. I need a bit of research. I have the same problem , any respond from Ravi ? and the other problem is it take more time to load it, whats wrong?? Please once check that store_item_row.xml root layout height must be a wrap_content. Hi @ravi8x:disqus , I’ve two question related to BottomNavigation and i expecting help from you. 1. Here when we switch from Shop to Gift again click on Shop it’s go to fetch data again so, how can we avoid this and display first time loaded data? 2. Here on Backpress backstack working fine but selected menu not changing according backstack? @ravi8x:disqus can you please help me with above mentioned point ? 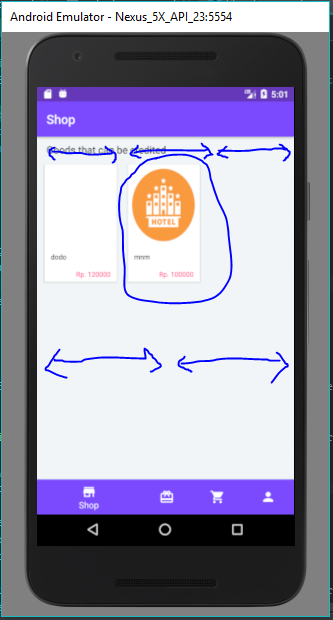 You can store the data in local storage like MySQL or Realm and show it directly. You can keep an interval like 5mins to fetch the new data. This has to done automatically by the navigation widget itself, unfortunately it is not. Try the code provided in the below discussion. Answer of 2nd question should solve this issue by doing the changes in the logic. Hi, i have a question. How to disable the animation when there are 5 items in the bottom navigation bar. I just want the icons to be static. Implemented, works great, thank U! 🙂 . Hi @Ravi Tamada:disqus thanks to the tutorial. I have a question how to handle on rotation ? fragment changes if I rotate the emulator. The compiler has problem to find the calls to dimen, for example “@dimen/card_album_radius”. You need to create dimen.xml under res -> values folder. Can you paste the screenshot of the app when the toolbar is disappeared? yes i knew that, but the point was not to put my own values. That because the graphics could be “ugly”. The source code is the same as the tutorial. The only difference is in the MainActivity where i declare the toolbar as variable Toolbar not action bar. Can you try using AppBar instead of just the Toolbar as provided in the article? Hello sir I want to use BottomNavigation on Tablet in landscape mode. can i use more than six destinations ? Try modifying and fixing the bugs in the current article. As not many people are asking for an update, I am giving it less priority. Thanks Mohamad. I wish you the same. I am working customizing maps. It will be published after couple of articles. The swipe experience shouldn’t used with Bottom Navigation as per google design specs. Have you added the design support library in gradle? I have confusion regarding setting the jsonArray data to the POJO.Where you actually setting ? And how in the onBindViewHolder() we are getting the exact same data without setting first. This is called JSON serialization. We can avoid manually parsing JSON by using GSon library. What we do is, keep the variable name same as JSON node name. While serializing it maps the JSON value with matched variable name in POJO class. If you want use different name for the variable, we can use annotations. Read the GSon documentation for better understating. 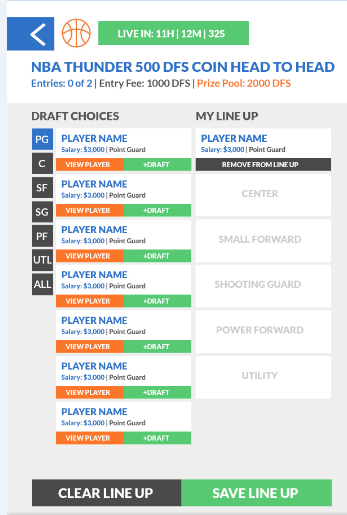 How can I have 4-6 cards of different categories on Page 1 with each having a View More button and when clicked under a specific category will take to the 2nd page which will have all the cards of the category.=? Seems there is an error in your layout files. Check all the layout files. You might be missing params of height and widget or other related attributes. Thanks Ravi for great tutorial. How to switch between fragments with rubbed by hand? For that you need to use ViewPager but ViewPager shouldn’t be used with Bottom Navigation as per google desc specs. ViewPager navigation should be used with Tabs. my fragments are not loaded … please help me..
internet permission is also placed. 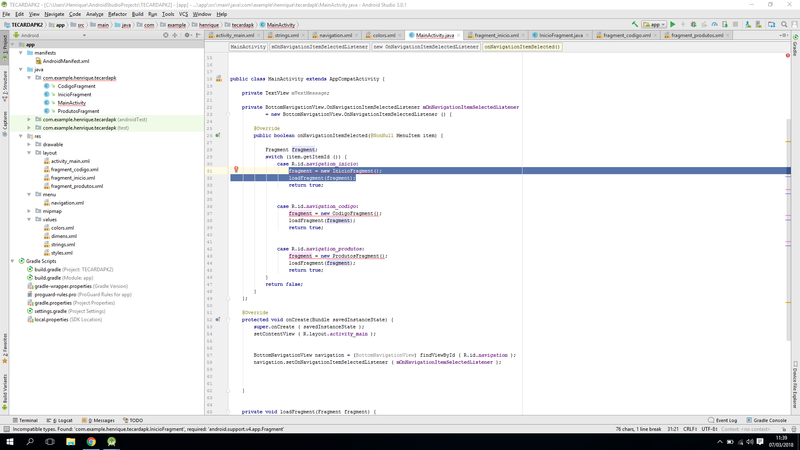 MyApplication class has to be added to AndroidManifest.xml <application> tag. Do you have a tutorial on how to cache the fragments, so I don’t have to load data every time I click the fragment? Wow..this tutorial is so simple and direct..thank you Ravi..you just saved me.. I want to know how to stop reloading every time i click on the store fragment ? You can but no guarantee of consistent experience on all the devices. Can I change the first menu. I mean to say, like I add 3 menu and I want the mid one should be visible on activity launch. Is it possible? Did you notice java memory in android profile – it’s increasing as you click on menu items repeatedly? Is it a memory leak . I think it is bug in bottom navigation itself. Try without fragments just simple navigation piece with simple switch statement. Java memory increases but will not come down after waiting for long period. Sharing BottomNavigationViewHelper code may helps others. hi @ravi8x:disqus just wondering what version of android studio you are using because i am getting a few errors early on, null pointers etc. Try removing https from the url and try with http. If the server ssl certificate is poor, you will see this error. If you are using Retrofit, try adding SSL Ciphers from the featured comment below this article. Try in other devices as well. But in production app, the server should have good SSL certificate installed. can we select a fragment without clicking on the navigation botton ? Is it possible ? I mean automatically to select position of navigationButton ? hi @ravi8x:disqus you can do a tutorial if you click on the RecyclerView to open a new activity (details) ? When i try to use Retrofit, i cannot access your link and when i go to the log, it says that the response code is 405, which means that my apps is not allowed to access your json code. Can you please help me? I want to ask again 🙂 I want to change the size of the recyclerview item that is drawn below, right it every 1 line there are three items. Well I want to turn it into 2 items per line that how I’ve tried to change but it always fails. Thank you for Answare. In your main activity change the number from 3 to 2 in the below line. Paste the code you used to launch the detailed activity or fragment. 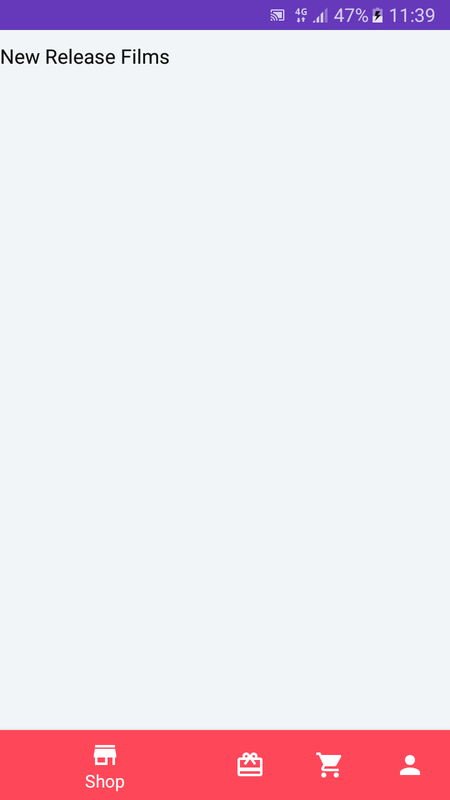 I am guessing you are displaying images from an Url. If yes, just pass the image url as String. On the detailed fragment, get the image url from the bundle arguments and display the image using Glide or Picasa. Check the JSON node and variable name in Movie class. They should match or use @SerializedName annotation. Can you post any error report? This is what i have on one of my fragment pages. (a series of buttons) now how and where do i put the code for listening to button press’s and changing the fragment while keeping the bar at the bottom of the new page etc. The button clicks should be implemented in Fragment itself. If you want to notify your main activity about the click, use interface to define a method in fragment and implement the method in main activity. Are you able to provide an example for me to try and implement. the structure of the code for both fragment and main are pretty much similar to your original code. Have you tried adding 5 items in navigation.xml? I have already shown the screenshot with 5 buttons. Do you have actionBar included in your layout or from the theme? how can i add click listener on this code ? Make sure your activity has Toolbar included via xml or from the styles. Are you able to run my code downloaded from this article? how to implement left/right sliding effect to this? 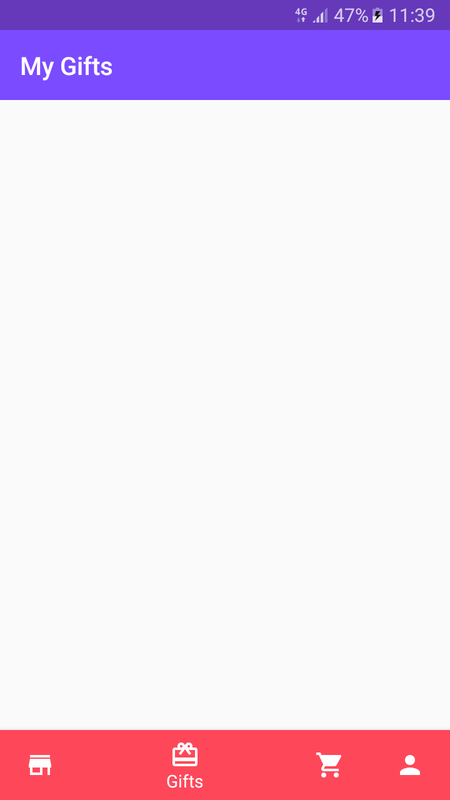 As per android docs, left / right sliding shouldn’t be used with Bottom Navigation. ohh my bad ! BTW thanks.. Try using a ViewPager and when page is swiped, change the navigation tab and vice-versa. Hii @ravi8x:disqus sir.I’m just a beginner as a Android Developer .My question is why we use Basic Activity instead of Bottom Navigation Activity in starting? how to remove bottom title from bottom navigation? We can but google guidelines not prefers that way. these line working in activity but not in a fregment . how can i used these lines in fragment. use `getActivity()` instead of `this`. The two columns can be achieved by RecyclerView and Cards combined with StaggeredGridLayoutManager. Can you post the complete error? how to create bottom navigation like instagram? 1.can we use single cardview n recyclerview code for 3 or more activities? 2.How to connenct the 3 cardviews to each other? Hello Ravi thank u for your tutorials . I am displaying data in a recycler view like you did but the problem is insert data in that recyclerview in the same fragment so i’d like to reload the fragment when i insert the data is that possible ? Post your code of ProfileActivty (at least until line number 35). Sir , Can you please ? I want to show shadow in my custom made bottom navigation bar. I have tried many options but none of them is working for me. Kindly help. The Bottom Navigation suppose work as Tabs, it shouldn’t open an activity. okay so how do you create a tab within the bottom navigation bar? please answer need this for project! i got error in storefragment..
Hey Can u please tell me how do i keep the icons and text fixed and now like now the text shows up when clicked in the icons>? Hi @ravi8x:disqus Thank you so much for the code. I implemented the BottomNavigationView, but when i open a child fragment from one the tab parent fragment and then switch to another tab and click back to the parent tab is closing the child fragment. Please help me on this. Thank you. Can you fix when onBackPressed fragment changes but the selected navigation does not change? My project is running on android 8 version and but not on android 5.1.1. Is there a way to set item selected color? How do I set on item selected color? Let me know how to hide Toolbar while scrolling list. Omg, thank you. I was looking for a well documented example and yours is the best I found. Hi , I wanted to show recycler view in fragment with firebase recycler adapter , but data is not coming in fragment , but same working fine in Activity . hello sir i prefer the same code for list view bt m unable to hide bottom navigation bar.plz help me. For Android P Navigation bar can be hide. Instead of Navigation bar we can use Navigation gesture. Can you please guide me How to check whether Navigation gesture is on instead of navigation bar? Hii Sir,, help me,, my aplication error at dimens.xml..
Tell me whats the error?